INVINCIBLE #127, 2nd printing (Diamond Code MAR168716) will arrive in stores on Wednesday, May 25, 2016. The Final Order Cutoff deadline for retailers is Monday, May 2, 2016. 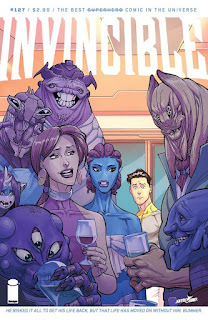 INVINCIBLE #128 (Diamond Code MAR160570) will arrive in stores on Wednesday, May 18, 2016.